Cultural Anthropology, urban studies, racial formation, relationship between policy and racial/ethnic disparities, Latinos, immigration, youth, and contemporary politics; United States, Spanish-speaking Caribbean. 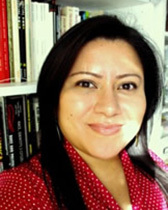 Ana Aparicio is a cultural anthropologist whose work focuses on two major areas of research: 1- ethnographic research on the ways in which people of color (including immigrants and Latinos) and youth engage with and construct local politics, develop coalitions, and transform public space; and 2- analysis of the relationship between policy and racial/ethnic disparities in various sectors, including public health care. Her work has received support from the Social Science Research Council and the National Science Foundation. She is currently on the Executive Board of the American Anthropological Association. She is the author of Dominican Americans and the Politics of Empowerment (part of the New World Diasporas series edited by Kevin Yelvington, University Press of Florida, 2006), which received the 2006 Association for Latina and Latino Anthropologists Book Award Honorable Mention. One of the explicit goals of this work is to understand the dynamics of “community,” racial formation, and political citizenship in a contemporary urban, U.S., racialized, Latino/a, and Caribbean immigrant context. She is also the co-editor of Immigrants, Welfare Reform and the Poverty of Policy (Greenwood, 2004). Her most recent research – funded by the National Science Foundation – is an ethnography of race and public space in contemporary suburbia; more specifically, she is examining suburban Latino and immigrant populations, inter-group relations, and the transformation of suburban public spaces. Aparicio has also worked with city and nonprofit organizations examining racial and ethnic disparities; this work has covered areas such as healthcare, welfare reform, education, and the construction industry. 2010. "Transglocal Barrio Politics: Dominican American Organizing in New York City." Gina Pérez, Frank Guridy, and Adrian Burgos, eds. Beyond the Barrio (NY: NYU Press). 2008. “Reconstituting Political Genealogies: Reflections on Youth, Racial Justice, and the Uses of History.” Souls: A Critical Journal of Black Politics, Culture, and Society 10(4): 361-373. Reprinted in Leith Mullings, ed., New Social Movements in the African Diaspora (Palgrave 2010). 2007 “Contesting Race and Power through the Diaspora: Second-Generation Dominican youth in the new Gotham.” special issue on youth and globalization, City and Society, 19(2): 179-201. 2006 Dominican-Americans and the Politics of Empowerment, University Press of Florida. 2005 “Latinos in New York,” entry in Oboler and Gonzalez, eds., Encyclopedia of Latinos and Latinas in the United States, Oxford University Press. 2004 co­edited with Kretsedemas, Immigrants, Welfare Reform and the Poverty of Policy, Greenwood/Praeger Press. 2004 “Immigrants’ Access to Public Health Care Systems in New York’s ‘Post-Reform’ Era.” In Kretsedemas and Aparicio, eds., Immigrants, Welfare Reform and the Poverty of Policy, Greenwood/Praeger Press. 2004 co­authored with Rai and Kretsedemas, “Reflections on Immigrant Hardships after Welfare Reform: New Challenges and Changing Trends.” In Kretsedemas and Aparicio, eds., Immigrants, Welfare Reform and the Poverty of Policy, Greenwood/Praeger Press. 2003 co­authored with Davis, Jacobs, Kochiyama, Mullings, Queeley, Thompson. “Working it Off: Welfare Reform, Workfare and Work Experience Programs in New York City.” Souls: A Critical Journal of Black Politics, Culture, and Society 5:2 (Spring 2003). reprinted in Manning Marable, ed. 2005. The New Black Renaissance. CO: Paradigm.